This information was given by Minister of State for Road Transport & Highways, Shri Pon Radhakrishnan in a written reply to a question in the Rajya Sabha today. For decongesting Delhi, the Union Government has approved the investment / award decision for the project of Eastern Peripheral Expressway (National Highway No. 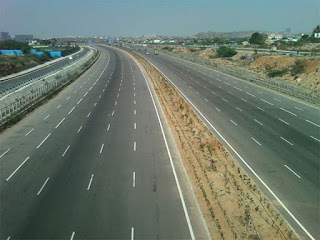 NE -II) from Km 0.00 to Km 135.00 (starting from Km 36.083 on National Highway NH – 1 and ending at Km 64.330 on National Highway NH-2) in the states of Haryana and Uttar Pradesh on EPC mode in six packages for six laning of 134.946 Kms long section at an estimated cost of Rs. 7558.30 Crores including Rs. 1795.20 Crores for the cost of land acquisition, rehabilitation, resettlement and other pre-construction activities. Besides, Ministry of Urban Development has also constituted a High Power Committee under the chairmanship of their Secretary to prepare a report on “How to Decongest Delhi”. The draft report is available on website of Ministry of Urban Development. Govt of Tamil Nadu commissioned a scientific GIS based Road Accident Data Management System (RADMS) with the assistance of World Bank. This Ministry has advised State Governments/ UTs for replication of Tamil Nadu model of RADMS. Total investment expected to construct and improve roads during the year 2015-16 would be Rs. 110,000 Crores, out of which Rs. 40,000 Crores has been allocated under Budgetary Support, Rs. 43,000 Crores would be from Internal and Extra Budgetary Resources (IEBR) and Rs. 27,000 Crores are expected to be invested by private sector. Presently, 4-laning work in Jammu-Srinagar section (except Udhampur-Ramban and Ramban-Banihal section) of National Highway (NH)-1A (Old) is in progress under National Highways Development Project (NHDP) by National Highways Authority of India (NHAI). The work is delayed mainly due to delay in land acquisition, utility shifting and forest clearance. The work is targeted to be completed by June 2017. The 4-laning work on Udhampur-Ramban and Ramban-Banihal section is yet to be awarded by NHAI. Srinagar to Uri section of NH-1A (Old) is being developed to 2-lane NH standard by Border Roads Organisation (BRO). The work is delayed mainly due to the problems associated with land acquisition and utility shifting. All out efforts are made by BRO to complete the work by March 2017. A new mode of delivery under Public-Private Partnership (PPP) mode, namely Hybrid Annuity Model, is being considered for awarding road projects for implementation under which 40% of project cost is being provided by the Government to the concessionaire during the construction period in five equal installments. Remaining 60% is to be arranged in form of debt and equity to be compensated over 15 years as bi-annual annuities. Delay in land acquisition, utility shifting, grant of statutory clearances, non-availability of aggregates/soil, ban on mining in some states, public agitation, arbitration/contractual disputes etc. have caused delay in construction of highways across the country. Government has taken a number of steps to minimise such delays in future. Facilities such as restaurant/food court, low cost dhaba, telephone booth/ Automated Teller Machine (ATM), fuel station & minor repair shop, toilets, rest rooms for short-stay, kiosk for sale of miscellaneous sundry items etc. are available for commuters on National Highways (NHs). Government intends to provide facilities such as separate parking for cars, buses & trucks, restaurant/food court, low cost dhaba, telephone booth/ATM, fuel station & minor repair shop, rest rooms for short-stay, clean toilets, landscaping, kiosk for sale of miscellaneous sundry items, space for spreading Government welfare programme in a systematic and planned manner by setting up user-friendly wayside amenities along NHs. Wayside amenities now form part of major highway improvement projects. Beside, National Highways Authority of India (NHAI) has identified nearly 70 sites for setting up these facilities. A Project Management Consultant (PMC) has been appointed to assist in overall implementation of the project and to engage specialized firms for developing and operating these facilities. Further, Ministry of Road Transport & Highways grant access permission to the retail outlets located along the NHs. As per the licence agreement signed as part of granting such access permission, it is mandatory for retail outlets to provide toilet and drinking water facilities.